We've been asked many times whether it's possible to wake up Windows-based system from sleep mode (or hibernation) using a resident program. The answer is yes, it is possible. This simple utility will let you do it. Besides that it can also send your system back into sleep mode (hibernate it, power it off, or log-off a user). Moreover, you can also use this utility as a scheduler to run programs without involving sleep mode. WakeupOnStandBy program in U.S. English mode, Windows 10 screenshot. All controls in the main window of the WakeupOnStandBy are grouped into 5 sections, and are referenced as item (1), (2), (3), (4) and (5). You can select your preferred UI language by clicking on the flag in the top right corner of the WakeupOnStandBy main window. In case WakeupOnStandBy supports your default language it will display the flag of the country you're in. After changing the UI language you will need to restart all instances of the WakeupOnStandBy program for the change to take effect. In case you do not see your preferred UI language, you can volunteer to translate the program's UI. Click here for details. You may uncheck the date if only the time is relevant. In that case the current date will be used. If you specify the time earlier than now, the next day will be used instead. If checked, this option will first perform all the specified operations in item (1), it will then run a file in item (2) and trigger additional operations in items (3) and (4). This will happen in either of two cases: A. At the time scheduled in the item (1), or B. When computer wakes up from a suspended power state either from a wake timer, or after user input. This option has some limitations under Windows XP/Vista/7/8/10 due to security features of the latter. In case you have more than one Windows user account set up or if the screensaver is protected by a password, WakeupOnStandBy won't be able to display user desktop. All other tasks, like running & opening files, will be performed in order specified. To prevent the system from entering automatic sleep mode after user inactivity, use "Prevent automatic sleep" option described below. This option applies only to the situation when WakeupOnStandBy is in the waiting mode specified in item (3). In case Sleep/Hibernation/Shut-down/Log-off is not required, check "Simply wait" box and provide the time period to keep screen on. IMPORTANT: When using this option make sure that no other software or user attempts to change screensaver and power management parameters while WakeupOnStandBy is in the waiting mode specified in item (3), since this may cause conflicts in power management and screensaver settings. This option does not prevent system from entering a suspended power state (such as the Sleep mode or hibernation). Note that this behavior is different from previous versions of WakeupOnStandBy and is Operating System specific. WARNING: Use this option for a short waiting period only. If left on for a long time it will keep your screen on and thus void all attempts to save energy! You may want to do this before opening a web page, specified in the item (2), or if the Internet connection is required for a program to run in item (2). This option can be set up to make WakeupOnStandBy wait before connection(s) are fully repaired, or to repair only specific connection(s). Refer to Settings below for more info. You can either type it in, or click the "..." button on the right-hand side to select a file from a helper dialog box, or drag it in from another window, from your desktop or from your web browser. Fore more information see "Supported File Types" below. You may also want to check this screencast for the demonstration of how to specify a file. By default when opening a file/program the WakeupOnStandBy will wait for it to initialize before continuing. To change that check the Settings described below. If not specified otherwise, WakeupOnStandBy will run a program even if another instance of the same program is already running. To see how you can change this behavior refer to the "Supported File Types" section below. If specifying a file, you may click the "..." button on the right-hand side to select it from a helper dialog box, or drag it in from another window, from your desktop or from your web browser. For more information see "Supported File Types" below. You may also want to check this screencast for the demonstration of how to specify a file. In case command line parameters contain spaces we recommend that you include them into double quotations marks. You can also drag file icon, or selected text into this window from another window, from Windows Explorer or from your web browser. After that specify how much time should pass, in the "Wait For" fields. You may click the "Pick..." button to select waiting period as an absolute date & time measured from the current time. WakeupOnStandBy can keep computer on during this waiting period. See description of "Prevent automatic sleep" option below. This may be required to override the Operating System's idle power saving setting. If this box is not checked, all running programs will be polled for permission to proceed. If this option is checked, the system will perform power operation without notifying running programs about it. WARNING: Shutting down or logging-off in the forced way may result in the loss of unsaved data! Windows XP: If enabled will also prevent any other programs from attempting to send system into a Stand-by mode or hibernation. Windows Vista/7/8/10: If enabled will not stop other programs from sending system into Sleep mode or hibernation. And provide path for the file/program or URL for a web page in the field below. You can either type it in, or click the "..." button on the right-hand side to select a file from a helper dialog box, or drag it in from another window, from your desktop or from your web browser. Fore more information see "Supported File Types" below. You may also want to check this screencast for the demonstration of how to specify a file. If specifying a file, you may click the "..." button on the right-hand side to select it from a helper dialog box, or drag it in from another window, from your desktop or from your web browser. Fore more information see "Supported File Types" below. You may also want to check this screencast for the demonstration of how to specify a file. This will make WakeupOnStandBy run in Repetitive Mode, or reside in memory after successful completion of the current task and reschedule itself for another day. In case you want to broaden the scope of days, you can run it every 2nd, 3rd, or 4th week by selecting appropriate boxes. Automatic rescheduling happens right after completion of all tasks. WakeupOnStandBy uses the time specified for previous wake-up event to reschedule itself for another day according to the weekdays and weeks selection. While in Repetitive Mode, WakeupOnStandBy will reside in memory and if the system is rebooted WakeupOnStandBy will load up and resume automatically when a user that started it logs in to the system. Be aware of this limitation, since if no user is logged in to the system WakeupOnStandBy will not be able to reschedule itself. To cancel the Repetitive Mode simply exit WakeupOnStandBy and select Yes when asked whether you'd like to cancel the schedule. Scheduled events in the Repetitive Mode could be skipped in case the system entered a power state other than sleep or hibernation (power states S3 and S4). In this case, when powered on, WakeupOnStandBy will skip to the next scheduled event. IMPORTANT: Only after you click the Start button your settings will take effect. IMPORTANT: WakeupOnStandBy should be started, or activated ONLY from a permanent location on your local disk. This will ensure that it can be loaded when the system is restored or rebooted. Windows XP: In case "Windows auto-logon" feature is enabled in the Settings, WakeupOnStandBy will modify the System Registry to attempt to log in the current user automatically. Note that by using this option you allow your Windows user password to be stored in the System Registry in plain text! WARNING: The "Windows auto-logon" option should be used sparingly since it bypasses the user logon and potentially exposes the user password that is stored unprotected in the System Registry! The "Schedule Info" section will contain the time at which system will attempt to wake up, or perform the next power event. The bottom part of this section will display other important information about the scheduled events. In case of an error you will hear a sound beep and an error message will be displayed in the "Schedule Info" section. You can disable sound beeps in the settings. It will open Schedules Report in a web browser window. 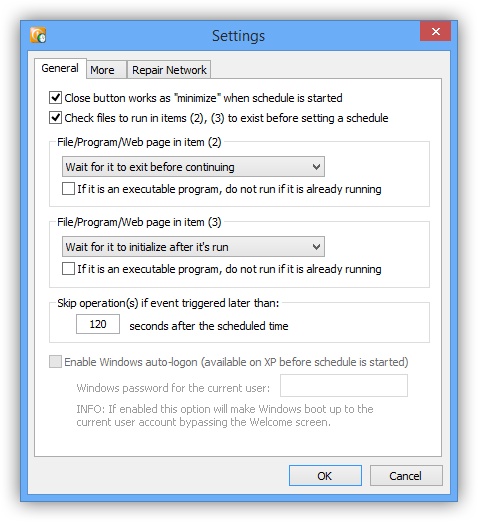 To enable behavior described above, check the "Close button works as minimize when schedule is started" option in the Settings. Now the WakeupOnStandBy is activated and you can send your system into Sleep mode (or hibernate it) to be woken up automatically. It doesn't make any difference whether WakeupOnStandBy runs in a window or from the system tray to be able to wake your system. When exiting an activated instance of the WakeupOnStandBy program, it will prompt a user whether they'd like to cancel the schedule and exit. If 'Yes' is selected, the WakeupOnStandBy schedule will be canceled and, if specified earlier, the Repetitive Mode removed. To disable the warning before the schedule is canceled, use the "Show user warning when exiting WakeupOnStandBy with a set schedule" option in the Settings. When exiting all instances of the WakeupOnStandBy program, it will prompt you whether you'd like to cancel all schedules and exit. If you select 'Yes', all schedules will be canceled and, if specified earlier, the Repetitive Modes will be removed from all running copies of the WakeupOnStandBy program. You may want to use this option before uninstalling the WakeupOnStandBy program from your system. 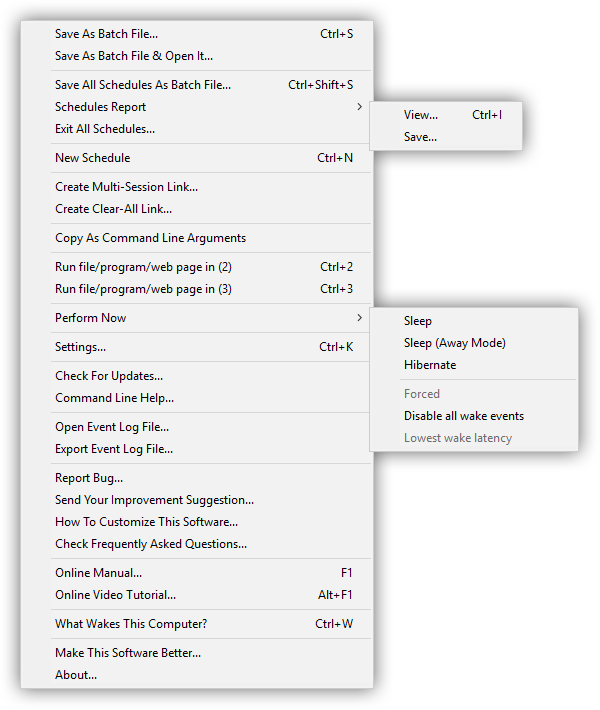 To run multiple copies of the WakeupOnStandBy program either use Ctrl+N keyboard shortcut while the main WakeupOnStandBy window is open, or use "New Schedule" context menu command, or create the "Multi-session link" first and then use it to start the program. To re-schedule the wake event, exit and restart WakeupOnStandBy program. You may also want to save your current schedule using the "Save As Batch File" or "Save All Schedules As Batch File" commands from the context menu. INFO: You may want to consider viewing the following screencast for the demonstration of how to specify files to run at a wake event. Executable programs - although you can simply specify the name of an executable file, we strongly recommend that you use the "..." search button on the right side of the file box to locate the program. The effect of the asterisk (*) symbol is overridden by the global "If it is an executable program, do not run if it is already running" option in the Settings. The asterisk (*) symbol does not affect non-executable programs, such as documents, web pages, etc. Program links (or shortcuts) are also not affected by the asterisk (*) option. Documents, Pictures, Music Clips, Video Clips and other files - use the "..." search button on the right side of the file box to locate these files. Web pages - type the URL for the web page starting with "http://" or "https://" to allow WakeupOnStandBy to differentiate it from a file on your local computer. Internet connection is required to display a web page. In case web page is saved on the disk drive for offline viewing, you can locate it using the "..." search button on the right side of the file box. Links - you can open any local links or URLs with WakeupOnStandBy as well. The best way to specify a link is to drag it off your desktop/Windows Explorer/web browser into the WakeupOnStandBy path field. Internet connection is required to open an Internet resource. Some local control panel links may not be supported due to the Operating System's security restrictions. Dragging links or selected text from the Internet Explorer may not be allowed by the Operating System's security restrictions. In case the name of a file/program/web page contains spaces it is strongly recommended that you include it in the double quotation marks. To run more than one file you can use Windows batch files. Read FAQ section for more information. #DATE# - will be replaced with the current local date at the moment of execution of the program in the following format: MM.DD.YYYY, where MM=Two digit month number; DD=Two digit day number; YYYY=Four digit year. #TIME# - will be replaced with the current local time at the moment of execution of the program in the following format: HH.MM.SS, where HH=Two digit hour number in the military (24 hr) format; MM=Two digit minute; SS=Two digit second. #DATETIMESTAMP# - will be replaced with the current local date & time stamp at the moment of execution of the program in the following format: MMDDYYYYHHmmSS, where MM=Two digit month number; DD=Two digit day number; YYYY=Four digit year number; HH=Two digit hour number in the military (24 hr) format; mm=Two digit minute number; SS=Two digit second number. #FILETIMESTAMP# - will be replaced with the current date & time stamp at the moment of execution of the program that will be represented as the number of 100-nanosecond intervals since January 1, 1601 in hexadecimal format. INFORMATION: The following previously supported but now deprecated meta symbols are supported for backward compatibility: %DATE%, %TIME%, %DATETIMESTAMP%, %FILETIMESTAMP%. It is advisable to change them in favor of new meta symbols listed above. This is also a default option when the WakeupOnStandBy program's icon is double-clicked on the system tray. Save As Batch File - Opens up a window that lets you pick location to save the current schedule selection in the WakeupOnStandBy main window into Windows batch file. This could be useful in case you need to run WakeupOnStandBy with the same schedule again. To do so, one needs to simply run the resulting batch file from the Windows Explorer, or from any other program. This command can be also accessed via the Ctrl+S keyboard shortcut while WakeupOnStandBy window is up on the screen and has the keyboard focus. When saved, each batch file contains additional non-executable Command Line Helper information attached to the bottom of the file that is designed to facilitate editing of the command line, that is located at the top of a batch file. Each line of a batch file that starts with the word REM is a non-executable line that is omitted during execution. Save As Batch File & Open It - Opens up a window that lets you pick location to save the current schedule selection in the WakeupOnStandBy main window into Windows batch file, and later opens this file in a Notepad to allow editing. This could be useful in case you need to run WakeupOnStandBy with the same schedule again. To do so, one needs to simply run the resulting batch file from the Windows Explorer, or from any other program. When saved, each batch file contains additional non-executable Command Line Helper information attached to the bottom of the file, designed to facilitate editing of the command line, that is located at the top of a batch file. Each line of a batch file that starts with the word REM is a non-executable line that is omitted during execution. Save All Schedules As Batch File - Opens up a window that lets you pick location to save all currently running schedules in all copies of the WakeupOnStandBy program in a single batch file. Such batch file could be used later to restart those schedules. To do that, simply run the resulting batch file from the Windows Explorer, or from any other program. This command can be also accessed via the Ctrl+Shift+S keyboard shortcut while WakeupOnStandBy window is up on the screen and has the keyboard focus. This command is available only if there's more than a single activated schedule. To be able to run multiple copies of the WakeupOnStandBy program create the "Multi-session link" first and then use it to start the program. Alternatively, you can run a second instance of the WakeupOnStandBy program by using Ctrl+N keyboard shortcut, or the "New Schedule" menu command. When saved, a batch file contains additional non-executable Command Line Helper information attached to the bottom of the file, designed to facilitate editing of the command lines, that are located at the top of a batch file. Each line of a batch file that starts with the word REM is a non-executable line that is omitted during execution. View - Opens the Schedules Report in a default web browser. This command can be also accessed via the Ctrl+I keyboard shortcut while WakeupOnStandBy window is up on the screen and has the keyboard focus. This option may fail if there's no web browser currently configured in the system. Save - Opens up a window that lets you pick the location to save the Schedules Report as an HTML file. Exit All Schedules - Exits all open and running copies of the WakeupOnStandBy program for the current Windows user. If those copies of the WakeupOnStandBy program had activated schedules in them, it also cancels those schedules. This command can be useful to completely close all instances of the WakeupOnStandBy program. Before executing this command the WakeupOnStandBy program will issue a user warning prompting for confirmation. This option is available only if there's more than a single copy of the WakeupOnStandBy program currently open. To be able to run multiple copies of the WakeupOnStandBy program create the "Multi-session link" first and then use it to start the program. Alternatively, you can run a second instance of the WakeupOnStandBy program by using Ctrl+N keyboard shortcut, or the "New Schedule" menu command. New Schedule - Opens a new copy of the WakeupOnStandBy program that can allow you to set up another schedule. This command can be also accessed via the Ctrl+N keyboard shortcut when the WakeupOnStandBy window is active and has the keyboard focus. The maximum number of simultaneously running copies of the WakeupOnStandBy program is 256. WARNING: Overlapping schedules may adversely affect and in some circumstances even deadlock your computer! Use caution when running more than a single copy of the WakeupOnStandBy program. Create Multi-Session Link - Opens up a window that lets you pick location on the disk to create the Multi-session Link for the WakeupOnStandBy program. By default WakeupOnStandBy program runs as a single instance, or copy. That was necessary to prevent confusion among several simultaneously running schedules. The Multi-session Link will allow you to run more than one copy of the WakeupOnStandBy program at the same time. When using this option, make sure to run WakeupOnStandBy program from a permanent location on your local disk. This will ensure that the link can be loaded when the system is rebooted. WARNING: Overlapping schedules may adversely affect and in some circumstances even deadlock your computer! Use caution when running WakeupOnStandBy from the Multi-Session Link! Create Clear-All Link - Opens up a window that lets you pick location on the disk to create the Clear-All Link. This link may be used to exit all running copies of the WakeupOnStandBy program, including canceling all current schedules. IMPORTANT: When using this option, make sure to run WakeupOnStandBy program from a permanent location on your local disk. This will ensure that the link can be loaded when the system is rebooted. For details refer to the description of the /closeall command line parameter. This option could be useful for "visual" creation of command line arguments. See Command Line description for more info. Run file/program/web page in (2) - Will attempt to run a program, open a file, or a web page specified in the item (2) of the main window in the WakeupOnStandBy program. This command can be also accessed via the Ctrl+2 keyboard shortcut while WakeupOnStandBy window is up on the screen and has the keyboard focus. This option may be useful to test scheduled event before it is triggered. Run file/program/web page in (3) - Will attempt to run a program, open a file, or a web page specified in the item (3) of the main window in the WakeupOnStandBy program. This command can be also accessed via the Ctrl+3 keyboard shortcut while WakeupOnStandBy window is up on the screen and has the keyboard focus. Sleep - will send system into Sleep mode immediately. If WakeupOnStandBy is not activated, this option will issue a warning before performing power operation. Otherwise, no warning will be shown. Windows XP: Before using this option, make sure to select desired parameters for the power operation listed below: "Forced", "Disable all wake-up events", and "Lowest wake-up latency". Sleep (Away Mode) - will send system into the Away Mode immediately. Windows XP/Server 2003: This option is not supported. In the Away Mode the computer appears to be sleeping while the system continues to perform tasks that do not require user input. Hibernate - will hibernate system immediately. Hibernation is when the contents of memory are saved on to disk, after which the system enters low power state. The contents of memory are resumed when the system wakes up. Hibernation is not supported on all systems & may be disabled by default. Read this FAQ for technical details. Forced - when checked will force going into Stand-by mode or hibernation from the commands described in this menu. In this case the system won't poll other running programs for permission to perform this operation. WARNING: Exercise caution when using this option, since forced power operation may adversely affect other running programs! Windows Vista/7/8/10: This option is not supported due to the architecture of the Operating System. Disable all wake events - when checked will disable all wake events when sending system into sleep mode or hibernating it using the "Sleep" and "Hibernate" commands in this menu. Checking this option will prevent WakeupOnStandBy from waking up your system later! Only manual wake event will be recognized in that case. This setting has no effect on Sleep mode or hibernation performed by the Operating System or any other software. Windows 7/8/10: This option is not supported due to the architecture of the Operating System. Lowest wake latency - when checked will request the lowest wake latency from the hardware when sending system into Stand-by mode or hibernating it using the "Sleep" and "Hibernate" commands in this menu. Windows XP: This option sends request for the hardware to wake system up as fast as possible. Settings - Opens up Settings window that allows to view or change the WakeupOnStandBy program's persistent settings. This command can be also accessed via the Ctrl+K keyboard shortcut while WakeupOnStandBy window is up on the screen and has the keyboard focus. In case of multiple running copies of the WakeupOnStandBy program, only one of them can display the Settings window. Check For Updates - Opens up the web page that will let you see if an update is available for your version of the WakeupOnStandBy program. Internet connection and a web browser are required for this option to work. In case you would like to receive a notification of an update when it is released, follow us on Twitter. Command Line Help - Opens up a window with a brief description of command line parameters. A more complete manual of command line parameters is provided here. Open Event Log File - Opens the WakeupOnStandBy program's Event Log file in your default web browser. This option is available only if Event Logging is enabled in Settings. The Event Log file is composed of individual lines of text with technical information about the operation of the WakeupOnStandBy program. The newest lines will be placed at the bottom of the Event Log file. You would normally need to enable and review the Event Log file to diagnose or locate bugs in the operation of the WakeupOnStandBy program. For details view our screencast explaining the bug submission process. Export Event Log File - Trims the Event Log file to a manageable size, compresses it into a ZIP archive and allows you to select location to save the resulting file. IMPORTANT: Use this option to submit the Event Log file for our support team. It will ensure that the size of the resulting file is not exceeding the limitations of an email attachment. Report Bug - Opens up a window designed to facilitate reporting of software bugs in the WakeupOnStandBy program. Please use this option before you contact our tech support to resolve any issues with the software. Also review the details of the bug report submission shown in this screencast. During the bug report submission none of your personal information is submitted to us. On top of that, we guarantee anonymity of all bug report submissions. Send Your Improvement Suggestion - Opens our website that allows users to submit their suggestions for improvement of the WakeupOnStandBy software. Please send you submissions in English only. How To Customize This Software - Opens our website that gives information on how developers of the WakeupOnStandBy software can customize it for your specific needs. Check Frequently Asked Questions - Opens our website that shows questions and answers that were already answered by our tech support team. Please check this page before submitting your tech support request. Online Manual - Opens up the latest version of this manual in your web browser. This command can be also accessed via the F1 keyboard shortcut while WakeupOnStandBy window is up on the screen and has the keyboard focus. Online Video Tutorial - Opens up the web page with screencasts that visually show how to use the WakeupOnStandBy program as video tutorials. This command can be also accessed via the Alt+F1 keyboard shortcut while WakeupOnStandBy window is up on the screen and has the keyboard focus. What Wakes This Computer? - Opens up a new "Wake Sources" window that allows to view information about what woke this computer during the last wake event, as well as to view information on wake devices and wake timers. It also allows to enable (or disable) wake devices from waking the system. This command is not available on Windows XP. Click "Wake Events" button to retrieve last N wake events. The information about them will be placed in the text window below. The information about wake events is retrieved from the Windows Event Log. "Wake Source" or what was the reason computer woke up from suspended power state, as reported by your chipset driver. Additional operating system specific/technical details about the wake event. Administrative rights are required to execute this command. This information is logged & provided by the operating system. Currently Active Wake Devices - List of names of wake devices that are currently active, or can automatically wake the system. A wake device is a hardware device that is present in the system that can automatically wake it up from suspended power state, such as sleep, upon some external input. For instance, a keyboard can wake the system after a key press. Or a network adapter can wake the system after it receives a "magic packet" used by WakeOnLAN feature, etc. When wake device is disabled, it should no longer be able to wake the system. Last Wake Source - additional information about the source of the last wake event. Currently Active Wake Timers - List of currently active wake timers. Note that the information in this list can change at any moment as software and services continue to run. A wake timer is a software counterpart to a wake device. It is a timer that can be set by software that is later used to wake the system from suspended power state, such as sleep. 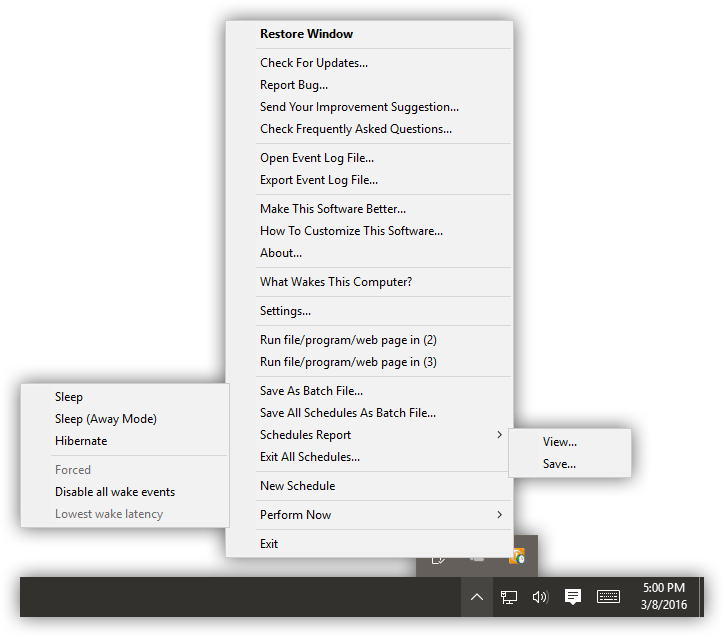 WakeupOnStandBy, as well as many other software products, such as Microsoft Task Scheduler, use wake timers to set their own automated wake events. Note that unlike wake devices, wake timers can lose their settings if the system is rebooted, and it is the job of software vendors to reset wake timers when the system is rebooted. WakeupOnStandBy does so by auto-running itself when the Windows user logs back in. Power Capabilities Tester - Information provided by WakeupOnStandBy's internal diagnostic tool concerning the power management capabilities of the system that you run it on. This information includes: Operating system and manufacturer name of the system, whether or not the system supports specific power modes, wake capabilities, as well as the list of currently active Task Scheduler tasks that can automatically wake the system, etc. When successful the device name should disappear, or appear back in the "Currently Active Wake Devices" section of the report in the text window above. Otherwise you will see a popup window with the system-provided error message. Make This Software Better - Opens up a window with links designed to provide additional information for the WakeupOnStandBy users for the purpose of improvement of this software. We rely on our users' submissions while planning new releases of this software. About - Opens up a window with information about this copy of the WakeupOnStandBy program. Use About window to retrieve the current version of the program, or to obtain additional information about this software. Exit - Exits the copy of the WakeupOnStandBy program that this option was invoked for, and cancels the schedule in it. Note that any other running copies of the WakeupOnStandBy program are not affected by this option. This option is available only from the system tray. To exit all running copies of the WakeupOnStandBy program and cancel schedules in them all use the "Exit All Schedules" option. When exiting an activated copy of the WakeupOnStandBy program, it will prompt a user whether they'd like to cancel the schedule and exit. If 'Yes' is selected, the WakeupOnStandBy schedule will be canceled and, if specified earlier, the Repetitive Mode removed. To disable the warning before the schedule is canceled, use "Show user warning when exiting WakeupOnStandBy with a set schedule" option in the Settings. The Settings window allows to view or change the WakeupOnStandBy program's persistent settings. To access the settings window right-click the main WakeupOnStandBy window, or right-click the WakeupOnStandBy icon on the system tray (next to the Windows clock) and select "Settings". The Settings window is divided onto several tabs that are described below. The settings window is available only in a single copy. In other words, if you have several copies of the WakeupOnStandBy program running at the same time only one will be able to display the Settings window. Close button works as "minimize" when schedule is started - when checked will make the close button in the WakeupOnStandBy program's main window act as the minimize button if the schedule is activated. Otherwise it will act as the Exit button. Check files to run in items (2), (3) to exist before setting a schedule - when checked will make the WakeupOnStandBy program check if the files specified to run after the wake event (in item (2) of the main window), and the file specified to run before performing the power operation (item (3) of the main window) exist before setting a schedule. If they don't exit, the WakeupOnStandBy program will issue a warning before schedule is set. This option can be used as a safeguard against malformed file paths. Do not wait - the WakeupOnStandBy program continues on to the next task as soon as it runs specified program. Wait for it to initialize after it's run - when selected will make WakeupOnStandBy program wait for the program to initialize before continuing on with the schedule. When used on a non-console (i.e. windowed, or GUI) program or file, this option will make WakeupOnStandBy wait until the program begins processing user input. In some cases, the conclusion of DDE initialization is used instead. Wait for it to exit before continuing - when selected will make WakeupOnStandBy wait for the program to exit before continuing. WARNING: Specifying this option for a program that requires user interaction to exit (such as most GUI applications) may deadlock the schedule in WakeupOnStandBy. This option is primarily designed for running console scripts and Windows batch files. If it is an executable program, do not run if it is already running - when checked will make WakeupOnStandBy program not run a duplicate instance of a program. This option does not affect files other than executable programs, such as documents, web pages, etc. Skip operation(s) if event triggered later than N seconds after the scheduled time - in some circumstances the system may be woken up later than the time specified in the item (1) in the main window of the WakeupOnStandBy program. (Some of the reasons that may lead to this are: A. Your computer may be shut down for a long period of time, or B. The system clock was adjusted forward that passed the wake event.) This option guards against performing operations in the items (1) through (3) when the actual time the system is woken up is more than N seconds after the scheduled time. By default we chose this value to be 2 minutes (or 120 seconds.) In some circumstances, especially in case when prolonged restoration from hibernation is observed on slower computers, it may be necessary to further adjust this value to a higher number of seconds. In case when operations are skipped and the WakeupOnStandBy program was running in the Repetitive Mode, it will simply reschedule itself for the next event. In case it was not running in the Repetitive Mode, the WakeupOnStandBy program will simply close. To see if operations were skipped, enable Event Logging and check the Event Log file afterwards. Enable Windows auto-logon (available on XP before schedule is started) - when checked will attempt to automatically log in current user when the system reboots. This option bypassed the Windows user logon screen. This option is available on Windows XP only. WARNING: This option should be used sparingly since it bypasses a user logon screen and potentially exposes a user password, that is stored in plaintext in the System Registry! (This limitation is beyond our control and is specific to the Windows NT-based system architecture.) Use this option only on systems that do not contain any sensitive user information. While a schedule is activated with this option on, WakeupOnStandBy program will attempt to write into protected System Registry key, which may potentially cause an antivirus program warning. The System Registry key will be cleared as soon as the schedule is canceled in the WakeupOnStandBy program. Windows password for the current user - Password for the current Windows user to be used for the auto-logon. Leave this field blank if the current Windows user doesn't have a password. WARNING: This password is stored in a scrambled key while in the WakeupOnStandBy program's data stack, but it may be exposed as plaintext when the Windows auto-logon option is activated! This limitation is beyond our control and is specific to the Windows NT-based operating system. The use of this option may potentially reveal your Windows user password! Max number of entries in the drop-down file helper boxes - allows to specify the maximum number of entries in the drop-down helper boxes used in the items (2) and (3) in the main WakeupOnStandBy program's window. These drop-down helper boxes keep track of previously used files or URLs to facilitate future selection. Acceptable values are 1 through 64. Begin waiting period in item (3) only after the operations in items (1) & (2) are completed - when a scheduled wake event occurs at the time specified in the item (1) in the main window of the WakeupOnStandBy program, there may be other operations required to be performed immediately after, such as the ones specified in items (1) and (2). This checkbox controls when the waiting period specified in item (3) should begin. When this option is checked, the waiting period in item (3) begins right after completion of all the operations specified in items (1) and (2); but if it is unchecked, the waiting period begins from the time specified in item (1). A) This option is not checked: Say, the system wakes up at 7:00:00 a.m. and it takes 20 seconds to repair network connections. Since this option is off, we had already begun the waiting period, so the system will be hibernated at 7:02:00 a.m.
B) This option is checked: Say, the system wakes up at 7:00 a.m. and again it takes 20 seconds to repair network connections. Because of this option we begin the waiting period from the moment when all previous operations were completed, thus the system will be hibernated at 7:02:20 a.m.
Show user warning when exiting WakeupOnStandBy with a set schedule - when checked will prompt a user for confirmation when exiting the WakeupOnStandBy program with an activated schedule. If unchecked, the prompt will not be shown and the WakeupOnStandBy program will automatically cancel the schedule and exit. Show warning if WakeupOnStandBy was run from a non-fixed drive - when checked will show a warning at the WakeupOnStandBy program's start-up, or before creation of the Multi-Session Link, if the program was started from a non-fixed drive. Otherwise no warning will be shown. WARNING: It is strongly recommended to run WakeupOnStandBy program only from a fixed drive (or your local disk drive). This is required to provide the optimum performance and consistency in case of the Repetitive Mode. Attempt to mask command line parameters that may contain sensitive data - when checked will attempt to replace any password references in the command line with asterisks. This option should be used only if password protection is enabled from the command line. WARNING: Although this option masks your password in the command line, it can still be accessed via the Operating System means elsewhere. It is not recommended to use password protection through command line within the WakeupOnStandBy program. This option will be deprecated in the next releases of this software. Do not play beeps and sounds during operation - when checked will prevent WakeupOnStandBy program from playing error or alert beeps. Note that this option does not affect system sounds when displaying message boxes. WARNING: If you disable showing of notification balloons you may miss any error or warning messages that WakeupOnStandBy may display concerning your schedule. Adjust schedule for DST change - this setting will make WakeupOnStandBy adjust the next invalid scheduled time according to the Daylight Saving Time change. For instance, if DST happens on March 8, 2015 at 2:00 AM by moving the clock one hour forward. In this case if the next scheduled time in the WakeupOnStandBy's schedule happens to fall on March 8, 2015 at 2:30 AM, with this setting on, it will be automatically reset to March 8, 2015 at 3:30 AM just for that day. Skip schedule - this setting will make WakeupOnStandBy simply skip the next invalid scheduled time caused by the Daylight Saving Time adjustment. Event logging is the internal mechanism in the WakeupOnStandBy program that records all technical information about the operation of the program. Event logging is highly recommended for debugging of the issues that you may experience when using WakeupOnStandBy program. Our support team will ask for your copy of the Event Log file before attempting to resolve any issues. For details view our screencast explaining the bug submission process. WakeupOnStandBy program does not attempt to collect your personal information in the Event Log file. In case any personal information may be included (like a command line password) it will be masked out from the Event Log file. Enable logging of the diagnostic events - when checked will enable Event Logging. Logging will begin (or end) as soon as you OK the settings window. Log File Path - provides means to specify the path to save the Event Log file on disk. IMPORTANT: For consistency and performance reasons it is highly recommended to use the location on your local disk drive. DO NOT use network shares or removable drives that may be temporarily disconnected when the system enters or leaves suspended power state, which can lead to loss of the event log entries! Browse For Folder - opens up a window that will let you pick location to place the Event Log file. When you specify a new location for the Event Log file, the file itself is moved from the previous location to the new one. Use Default Folder - fills in the default location for the Event Log file in the "Log File Path" field. It is recommended that you stick with the default location of the Event Log file. Restore Current Log Folder - restores the currently used path to the Event Log file in the "Log File Path" field. Open Log File - opens the Event Log file in your default web browser. Save Log File - opens up a window that will let you pick location to save a copy of the Event Log file to. IMPORTANT: This option will provide a simple one-to-one copy of the Event Log file. DO NOT use this option when requested to submit the Event Log file for our support team. The size of the uncompressed Event Log file may exceed the maximum allowed attachment size for an email transmission. Use the "Export Log File" option described below instead. For details view our screencast that shows the bug submission process. Export Log File - trims the Event Log file to a manageable size, compresses it into a ZIP archive and allows you to select location on disk where to save the resulting file. IMPORTANT: Use this option to submit the Event Log file for our support team. It will ensure that the size of the resulting file is not exceeding the limitations of an email attachment. For details view our screencast that shows the bug submission process. Delete Log File - permanently removes the Event Log file from your system, after a user prompt confirming the operation. It is recommended not to remove the Event Log file even after you're done monitoring the diagnostic events. The size of the Event Log file may be quite small in comparison to the size of your entire disk drive. 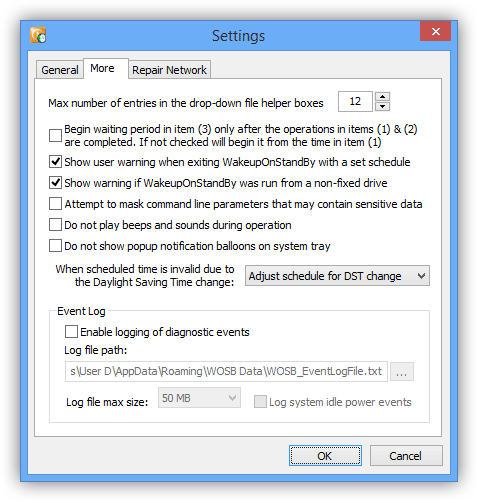 When disabling logging of the diagnostic events, make sure to also uncheck "Enable logging of the diagnostic events" option after deleting the Event Log file. IMPORTANT: Use this option when you no longer wish to log diagnostic events with the WakeupOnStandBy program, or when uninstalling it. Once removed the Event Log file could not be restored. Log file max size - specifies the maximum allowed size of the Event Log file. When the size of the Event Log file reaches this limit, all older records will be removed from it to satisfy the maximum size criterion. IMPORTANT: It is recommended not to set this value too low. Doing so may overwrite some important information in the Event Log file that may otherwise help resolve the issue. The default (or recommended) size of the Event Log file is 50 MB. Log system idle power events - when checked will include the system idle power events in the Event Log file. By their nature the idle power events may be broadcast with a high frequency that may clutter the Event Log file. Enable this option only after specific instructions from our support team. Commands to repair network connection(s) - allows you to provide the Windows Command Prompt commands to be used to repair network connections when such option is specified from the WakeupOnStandBy program's main window. The structure of commands in this box is the same as you would use in a Windows batch file. WARNING: Do not use any commands that require user input or display GUI windows. Using such commands will deadlock repairing of network connections in the WakeupOnStandBy program until the corresponding windows are closed or a user input is received. All commands are run synchronously (i.e. the next command is not executed until the previous command is done). To execute commands asynchronously, or to allow running of a non-console (GUI) applications, precede them with the start parameter. The Command Prompt window is not displayed during execution of these commands. 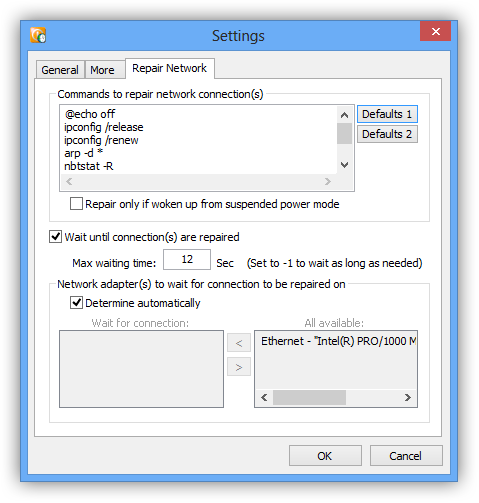 Repair only if woken up from suspended power mode - when checked and "Repair Network" option is specified in the main window of the WakeupOnStandBy program, or through command line parameters, will repair network connection(s) only if computer was woken up from a suspended power mode, such as sleep mode, or hibernation. "Defaults 1" button - when clicked will prompt to overwrite commands to repair network connections with the first group of default commands. These commands perform a more thorough repair of network connections. "Defaults 2" button - when clicked will prompt to overwrite commands to repair network connections with the second group of default commands. These commands perform a quicker repair of network connections. Wait until connection(s) are repaired - when checked and "Repair Network" option is specified in the main window of the WakeupOnStandBy program, or through the command line parameters, will wait for network connections to be repaired and functional before continuing. This option could be useful in case you plan on using an Internet/network connection in items (2) or (3) of the main WakeupOnStandBy window after computer comes out of a suspended power state. When checked, this option will make WakeupOnStandBy program wait before running the file/program/web page specified in the item (2) in its main window. To determine if a network connection is functional WakeupOnStandBy does not "ping" it, or check its IP address. Default gateway address is used instead. Max waiting time - specifies the maximum number of seconds to wait for network connections to be functional after beginning the repair. To make WakeupOnStandBy program wait for as long as needed, specify -1 in this field. The waiting time period specified here does not include the time necessary to execute commands in "Commands to repair network connection(s)" box. It begins the countdown after those commands finish running. If network connections are available prior to the expiration of the time limit specified by this parameter, WakeupOnStandBy program will go to the next item in the schedule immediately. In case specified time period elapses, the WakeupOnStandBy program will continue with the next task even if network connections are not repaired. Determine automatically - when checked will make WakeupOnStandBy program wait for connections using the network adapters that were previously functional (or before the system entered the suspended power state.) Uncheck this option if you want to specify network adapters manually. Wait for connection - field allows to specify names of network connections (as they appear in Windows Control Panel) and adapters to wait for connections. In case network connection is disabled in Windows, it's name will be presented as "<Disabled Network Connection N>", where N stands for connection order from A to Z. To add a new connection to the list of connections to wait on select it from the "All available" list first and then use the "<" button. To remove a connection from the list select it first and then use the ">" button. All available - field provides names of network connections (as they appear in Windows Control Panel) and adapters of all available network resources in the system. In case you need to refresh this list, close the Settings window and reopen it again. To facilitate programming of the command line arguments you can use "Copy As Command Line Arguments" feature available from the WakeupOnStandBy program's context menu. /run - should be specified to run WakeupOnStandBy from a command line. dt - sets the date to wake from a Sleep mode or hibernation. In the "%f" format sets the static date, where %f = date in the local format (Example: "12/25/2008" for US format). In the "+%d" format sets the date relative to today's date. (Example: "+1" will set the date for tomorrow.) If this parameter is not specified and 'weekdays' is not set, today's date is used instead. Otherwise the date of the week specified by the 'weekdays' parameter is used. This parameter can be overridden by the '/weekdays2dt' parameter. tm - sets the time to wake from a Sleep mode or hibernation. In the "%t" format sets the static time, where %t = time in the local format (Example: "12:00 pm" for US format). In the "+%h:%m:%s" format sets the time relative to the current time. If only two values are used, first one is interpreted as minutes and second one as seconds. In case of only one value it is interpreted as relative number of seconds. (Example: "tm=+1:30", will set the wake time 1 minute and 30 seconds ahead of current time.) If this parameter is not specified the current time plus 10 minutes is used instead. /weekdays2dt - can be used only if 'weekdays' is specified as well. Overrides the 'dt' parameter and sets the date according to the day of the week selection from 'weekdays' and 'weeks'. /ptowu - specifies that the wake tasks should be also performed if computer wakes up earlier than the scheduled time. IMPORTANT: This option has some limitations. In case you have more than one Windows user account set up or if the screen saver is protected by a password WakeupOnStandBy won't be able to display the user desktop. All other tasks, like running/opening files, will be performed in order specified. /keepscreenon - Instructs WakeupOnStandBy to keep monitor on during the time period specified by 'standbywait', 'hibernatewait', 'shutdownwait', 'logoffwait' or 'wait', if '/screenon' was specified as well. Use 'wait' option if hibernation/Sleep mode/shut-down or log-off are not required. /repair - repair local area network or high-speed internet connections (where available) right after the system wakes up from sleep mode or hibernation, or at the scheduled time. This option has additional functions that can be accessed via the Settings window when WakeupOnStandBy is running in a GUI mode. file - specifies the file to run after computer wakes up from sleep mode or hibernation, or at the scheduled time, where %f = Full path to the file, or a URL for a web page. To run several files put them into a batch file. (Read more here.) If the file is not specified, WakeupOnStandBy does not perform any actions after the wake event. This parameter could be overridden by "/testmsgbox". If you specify an executable file WakeupOnStandBy can prevent running more than one instance of it, if the "If it is an executable program, do not run if it is already running" global option is enabled in the Settings. You can also prevent running more than a single instance of the executable program by preceding its path with the asterisk (*). Read "Supported File Types" section for more information. #FILETIMESTAMP# for number of 100-nanosecond intervals since January 1, 1601 as a hexadecimal number. The following deprecated special words are supported as well: %DATE%, %TIME%, %DATETIMESTAMP%, %FILETIMESTAMP%. /nofilecheck - prevents WakeupOnStandBy from checking the validity of the file specified in the 'file' and/or 'awfile' parameters. /fdrir - if "file" parameter specifies an executable file, this option will not run it if it's already running. standbywait - sets the time interval to wait after the wake event before sending computer into sleep mode, where %h = Number of hours; %m = Number of minutes; %s = Number of seconds to wait. If this parameter and 'hibernatewait' are not specified computer is not sent into suspended power state, and WakeupOnStandBy simply closes, or reschedules for the next event in case of the Repetitive Mode. If only two values are specified (i.e., "%m:%s"), the first one is interpreted as minutes and the second one as seconds. In case of only one value (i.e., "%s"), it is interpreted as seconds. Set this value to 0 to send computer into sleep mode right after it's woken up, and the specified file is run. This parameter is mutually exclusive with 'hibernatewait', 'shutdownwait', 'logoffwait' and 'wait' parameters. IMPORTANT: It is strongly advised to allow at least 2 seconds of waiting time before sending system into sleep mode if you specified the 'file' parameter. hibernatewait - sets the time interval to wait after the wake event before hibernating, where %h = Number of hours; %m = Number of minutes; %s = Number of seconds to wait. If this parameter, 'standbywait', 'shutdownwait', 'logoffwait' or 'wait' are not specified WakeupOnStandBy simply closes, or reschedules for the next event in case of the Repetitive Mode. If only two values are specified (i.e., "%m:%s"), the first one is interpreted as minutes and the second one as seconds. In case of only one value (i.e., "%s"), it is interpreted as seconds. Set this value to 0 to hibernate system right after the wake event, and the specified file is run. This parameter is mutually exclusive with 'standbywait', 'shutdownwait', 'logoffwait' and 'wait' parameters. IMPORTANT: It is strongly advised to allow at least 2 seconds of waiting time before hibernating system if you specified the 'file' parameter. shutdownwait - sets the time interval to wait after the wake event before shutting computer down, where %h = Number of hours; %m = Number of minutes; %s = Number of seconds to wait. If this parameter, 'standbywai't, 'hibernatewait', 'logoffwait' or 'wait' are not specified WakeupOnStandBy simply closes, or reschedules for the next event in case of the Repetitive Mode. If only two values are specified (i.e., "%m:%s"), the first one is interpreted as minutes and the second one as seconds. In case of only one value (i.e., "%s"), it is interpreted as seconds. Set this value to 0 to shut system down right after it's woken up, and the specified file is run. This parameter is mutually exclusive with 'standbywait', 'hibernatewait', 'logoffwait' and 'wait' parameters. IMPORTANT: It is strongly advised to allow at least 2 seconds of waiting time before shutting system down if you specified the 'file' parameter. logoffwait - sets the time interval to wait after the wake event before logging off current Windows user, where %h = Number of hours; %m = Number of minutes; %s = Number of seconds to wait. If this parameter, 'standbywait', 'hibernatewait', 'wait' or 'shutdownwait' are not specified WakeupOnStandBy simply closes, or reschedules for the next event in case of the Repetitive Mode. If only two values are specified (i.e., "%m:%s"), the first one is interpreted as minutes and the second one as seconds. In case of only one value (i.e., "%s"), it is interpreted as seconds. Set this value to 0 to log user off right after the wake event, and the specified file is run. This parameter is mutually exclusive with 'standbywait', 'hibernatewait', 'wait' and 'shutdownwait' parameters. IMPORTANT: It is strongly advised to allow at least 2 seconds of waiting time before logging off user if you specified the 'file' parameter. wait - sets the time interval to wait after the wake event, where %h = Number of hours; %m = Number of minutes; %s = Number of seconds to wait. If this parameter, 'standbywait', 'hibernatewait', 'logoffwait' or 'shutdownwait' are not specified WakeupOnStandBy simply closes, or reschedules for the next event in case of the Repetitive Mode. If only two values are specified (i.e., "%m:%s"), the first one is interpreted as minutes and the second one as seconds. In case of only one value (i.e., "%s"), it is interpreted as seconds. This parameter is mutually exclusive with 'standbywait', 'hibernatewait', 'logoffwait' and 'shutdownwait' parameters. wfct - if specified, or if set to 1, will start counting the time period supplied in 'standbywait', 'shutdownwait', 'logoffwait', or 'wait' parameters from the current time, or the time when scheduled operations after the wake event have completed. Otherwise, or if set to 0, it is counted relative to the time of the wake event itself. This parameter overrides "Begin waiting period in item (3) only after the operations in items (1) & (2) are completed" option from Settings -> More page. /force - used with '/shutdown', '/reboot', '/logoff', 'shutdownwait', 'rebootwait', or 'logoffwait'. If specified forces operation to perform immediately. Windows XP: This option may be used with 'standbywait', 'hibernatewait', '/standby' and '/hibernate' parameters. IMPORTANT: If used for shut-down or log-off, may cause the loss of unsaved data in other programs! /psbh - used with 'standbywait', 'hibernatewait', 'shutdownwait', 'rebootwait', 'logoffwait', or 'wait' parameters. When specified will prevent system from automatically going into sleep mode or hibernation while waiting. This option will have no effect if a user sends system into sleep mode or hibernates it manually. Windows XP: If specified this option will also prevent any other programs from attempting to send system into Stand-by mode or hibernation. Windows Vista/7/8/10: If specified this option will not stop other programs from sending system into sleep mode or hibernation. If you specify an executable file WakeupOnStandBy may prevent running more than one instance of it, if the "If it is an executable program, do not run if it is already running" global option is enabled in Settings. You can also prevent running more than a single instance of an executable program by preceding its path with the asterisk (*). Read "Supported File Types" for more information. /awfdrir - if 'awfile' parameter specifies an executable file, this option will not run it if it's already running. weekdays - makes WakeupOnStandBy operate in the absolute Repetitive Mode, i.e. repeat specified tasks on certain days of the week. %d can be an enumeration of weekdays separated by space or + sign (example: Sunday+Monday), or use All for every day. %d can also be a bitmask for required days, calculated as such: 1=Sunday, 2=Monday, 4=Tuesday, 8=Wednesday, 16=Thursday, 32=Friday, 64=Saturday. Use simple addition to combine weekday bitmask values. Example: 34 = Monday & Friday. This parameter cannot be used together with 'repeat'. IMPORTANT: Do not move or rename the WakeupOnStandBy executable file (wosb.exe) after it was scheduled for the Repetitive Mode! WARNING: Exercise caution when setting WakeupOnStandBy program into Repetitive Mode when it was started from a Multi-Session Link, or with the '/ami' parameter. weeks - if 'weekdays' is set and is not zero, specifies repetition frequency in weeks: %d = 0 (or omitted) every week; %d = 1 for every second week (i.e. skip 1 week); %d = 2 for every third week (i.e. skip 2 weeks); %d = 3 for every fourth week (i.e. skip 3 weeks). This parameter cannot be used together with 'repeat'. This option has no effect by itself and has to be used along with the 'weekdays' parameter. If omitted or if a value other than 0, 1, 2, or 3 is specified, the default 0 value will be used instead. repeat - makes WakeupOnStandBy operate in the relative Repetitive Mode, i.e. repeat specified tasks after a certain time period, where %d = Number of days; %h = Number of hours; %m = Number of minutes; %s = Number of seconds to wait before repeating. This parameter cannot be used together with 'weekdays' and/or 'weeks'. The relative Repetitive Mode is available from this command line parameter only. It is not supported by the GUI controls of the WakeupOnStandBy program. /shutdown - shuts down computer immediately. None of the other parameters are used except '/force'. The '/ami' parameter is not required for this parameter if another instance of the WakeupOnStandBy program is already running. /standby - sends system into sleep mode immediately. None of the other parameters are used except '/dwe'. Windows XP: '/lwl' parameter is also supported for this option. /hibernate - hibernates system immediately. None of the other parameters are used except '/dwe'. /dwe - Disable all programmatic wake events. Used with '/standby' or '/hibernate' parameters to send system into sleep mode or hibernate it without the possibility of waking it up programmatically. Windows 7/8/10: This option is not supported. IMPORTANT: Specifying this option will prevent WakeupOnStandBy program from waking up your system later! Only manual wake events will be recognized. /ami - Without this parameter, WakeupOnStandBy program will not allow more than a single copy of itself to run at the same time. If specified, this option will allow multiple copies of the WakeupOnStandBy program to run at the same time, i.e. will make it run in a Multi-Session Mode (more info). Maximum allowed number of simultaneously running copies of the WakeupOnStandBy program is 256. Use this option to link one job in WakeupOnStandBy to another, or to set multiple schedules. /closeall - closes all running copies of the WakeupOnStandBy program & cancels all schedules. This parameter also cancels the Repetitive Mode for each running copy. No other parameters are used with this one. IMPORTANT: Read notes below for an example of usage of this parameter. /pwdclose - Password to stop activated schedule and exit WakeupOnStandBy program. (Password is not used if the schedule is not set.) %s = Password to use in plaintext. Alternatively you can scramble the password using the ScramblePwd tool. IMPORTANT: Scrambled passwords are valid only under the same Windows user account and on the same computer where you ran ScramblePwd tool on. Note that password can be effective only on the system where additional user account control is in place, such as a restriction on Windows user permissions that can prevent currently logged on users from terminating other applications. /? - Displays the help window. INFO: All of the deprecated commands have better alternatives among the active commands described above. Please do not use these commands as they contain inconsistencies in their implementation! INFO: Although it is not advisable to use deprecated commands, we will continue to support them indefinitely. /testmsgbox - [Deprecated] Overwrites "file" parameter and displays test message box instead of running a file at a wake event. date - [Deprecated] Sets the date to wake from sleep mode or hibernation. In "%m/%d/%y" format it sets static date, where %m = Month number (January=1, February=2, ... December=12); %d = Day number; %y = Four-digit year number. In "+%d" format sets date relative to today's date. (Example: "+1" will set the date for tomorrow.) If this parameter is not specified today's date is used instead. IMPORTANT: For backward compatibility the only accepted format for this parameter is the American date format described above. time - [Deprecated] Sets the time to wake from sleep mode or hibernation. In "%h:%m:%s" format it sets static time, where %h = Hour number in the military (or 24-hour) format; %m = Minute; %s = Second. In "+%h:%m:%s" format it sets time relative to the current time. If only two values are used, first one is interpreted as minutes and second one as seconds. In case of only one value it is interpreted as relative number of seconds. (Example: "time=+1:30", will set wake time 1 minute and 30 seconds ahead of current time.) If this parameter is not specified the current time plus 10 minutes will be used instead. For backward compatibility the only accepted format for this parameter is the American date format described above. /noeveryday - [Deprecated] removes settings to run WakeupOnStandBy in Repetitive Mode, or when it was set by the 'weekdays', or 'repeat' parameters before. None of the other parameters are used. IMPORTANT: DO NOT use this parameter when programming new instances of WakeupOnStandBy. Use '/closeall' parameter instead. /norepeat - [Deprecated] same as '/noeveryday'. vid - [Deprecated] sets the Visual ID that is displayed on the program's taskbar and on the system tray icon in case of more than one instance of the WakeupOnStandBy program are running simultaneously. This value is used solely for visual identification of the schedule. If not specified the Visual ID is assigned to a unique internal instance value. %v = Can be any number from 0 to 99. Windows Vista/7/8/10: This option is not supported by the Operating System. If used from a batch file (file with the .BAT extension) it is recommended that you include START command before calling wosb.exe, except when you specify '/closeall' parameter. # Only if run from a Windows Batch (.BAT) file! START wosb /run /systray /ami tm="3:00 am" standbywait="30:00"
START wosb /run /systray /ami tm="6:00 am"
# running instances of WakeupOnStandBy -- do NOT use START command here! If START command is specified the WakeupOnStandBy program will be executing asynchronously, which makes a more "clean" visual effect by closing the Shell Command Prompt window. If you do not specify START command the next line in the batch script is not executed until the current line is processed, which only matters when WakeupOnStandBy is run with the '/closeall' parameter. Assuming the North American date & time format is used by default in the system. wosb /run /systray tm="3:00 am" file="Notepad" standbywait="1:30"
INFO: Note that "/ami" option is used in the command line in case WakeupOnStandBy will be called again inside "Wakeupcmds.bat" file. If this option is not specified WakeupOnStandBy will not allow another copy of itself to run at the same time. Be careful when using this parameter as you may incur several instances of WakeupOnStandBy running at the same time, which may cause confusion. INFO: This example is given only to show how to use WakeupOnStandBy with the "params" values. In this particular situation it will be simpler to specify "WakeUp.wma" file in the 'file' parameter and leave 'params' blank to allow default player in the system to handle it. wosb /run /systray tm="+5:00:00" file="wmplayer.exe" /nofilecheck params="C:\Documents and Settings\All Users\Documents\My Music\WakeUp.wma"
WARNING: Computers are not accurate alarm clocks. Use specialized alarm clocks for that purpose when accuracy is important! INFO: This example requires active Internet connection and an account set up with Pandora. wosb /run /systray tm="7:00 am" /repair file="https://pandora.com" weekdays="Mon+Tue+Wed+Thur+Fri"
Assuming that hibernation is enabled & supported by the system. IMPORTANT: Do not use any external programs or "taskkill" to terminate WakeupOnStandBy! This may result in WakeupOnStandBy not cleaning up its System Registry entries. IMPORTANT: To ensure a proper execution you have to make sure that the following command is run synchronously and that no other calls to run WakeupOnStandBy come before this command exits. wosb /run /systray tm="3:00 am" /repair file="https://www.google.com" standbywait="30:00" awfile="clock.avi" repeat="5:00:00"
Note that we set the date parameter to a distant date in the future and used the '/ptowu' parameter at the same time. This is needed since the date and time parameters are required. INFO: Scrambled password was generated by the ScramblePwd tool. INFO: Note that the password must be scrambled under the same Windows user account & on the same computer where you're intending to use it in the WakeupOnStandBy program. wosb /run /systray tm="7:00 am" repeat="1:0:0:0" /pwdclose="xpd:'4PMBAAAA0Iyd3wEV0RGMegDAT8KX6wEAAACkhHtEZUqSQYEHXfhP4fcIBAAAAAIAAAAAABBmAAAAAQAAIAAAADY2JTBtyUBFraWHoAHPfzY50Y4EsgjyPVfs4lj2zCZDAAAAAA6AAAAAAgAAIAAAAPwzfr3UcsRqOfetAPjoXsSEczcUo7fbk2PRg5DUZTDmEAAAAJQidnBb7DOwLRr0gdZVd3FAAAAAKp5ddOBizEd6go4UwzQ4gWh1d/rSvKGS569GQ8eKTp6CUk1XVKNGqMM5Jmp9mybo5DSBcUv40/Oo5Tdbo1/O0zzU'"
SUGGESTION: We strongly recommend to test your schedules in the WakeupOnStandBy program before leaving it on its own. Due to different settings and hardware configurations some operations may not perform correctly on your particular system! This utility is hardware dependent! Older systems may not support it. If you see any warning messages when this utility starts up, this means that some of the features it employs are not supported by your system. Thank you for using WakeupOnStandBy! Feel free to send us your ideas, comments and especially bug reports. Even though we can't answer every single email, we listen and appreciate your time writing us!